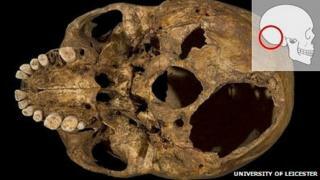 The remains of King Richard III, which were discovered under a car park, were buried in a "hastily dug, untidy grave", researchers have revealed. Academics from the University of Leicester said the bones were placed in an odd position, with the torso crammed in to the lozenge-shaped grave. The research also found the casual nature of the burial suggested a lack of respect for the king. But the academics said it may have been the work of gravediggers in a hurry. Listen: What happened at the Battle of Bosworth field? 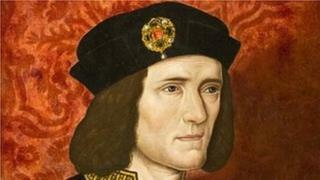 Richard died at the battle of Bosworth in 1485, at the hands of forces loyal to the future Henry VII. Contemporary sources spoke of the body being put on display in Leicester but the exact location of the grave, and even its existence, were the subject of debate. However a three-week dig at the site of the medieval Greyfriars church - now a council car park - last summer, quickly revealed remains of the church. When located, the grave was found to be too short for the corpse, leaving the head tilted forward, and the unusual position of the hands suggested the body may still have had its hands tied. The research came after the announcement in February that archaeologists had confirmed, through DNA and other evidence, the remains as those of the last Plantagenet monarch. The latest findings were revealed as archaeologists published a paper on the university-led search for Richard III in the journal Antiquity. 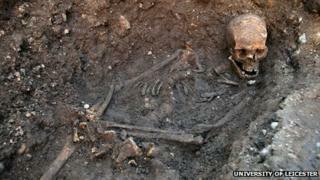 There were no signs of a shroud or coffin in Richard III's grave, in stark contrast to other medieval graves found in Leicester which were the correct length and were dug neatly with vertical sides, academics said. This is in keeping with accounts from the Tudor historian Polydore Vergil, who said Richard III was buried "without any pomp or solemn funeral".